Clark Kent has been dealing with a lot of stress since his secret identity as Superman was revealed to the world, and this influx of drama has dramatically upped the quality of Superman’s four titles at DC Comics. While the hero deals with a corrupted Metropolis police force and mayor’s office in Action Comics, Superman/Wonder Woman shows Clark taking on the U.S. government for abducting and imprisoning his friends, and last month’s issue ended with Clark barging into the Oval Office to have a word with the president. 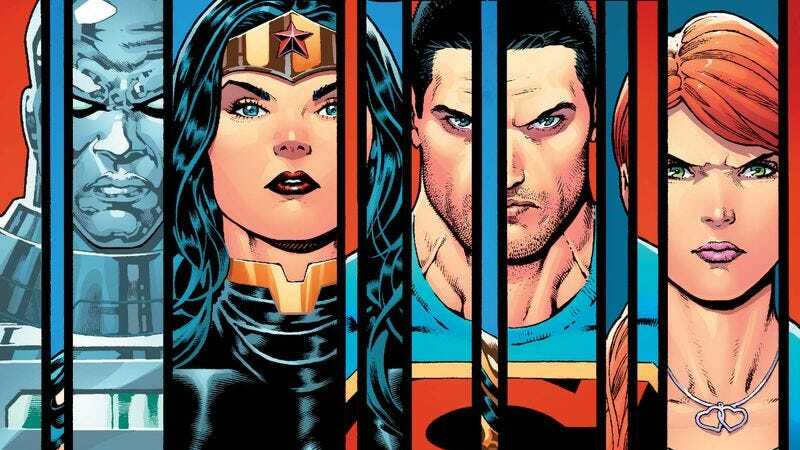 Writer Peter J. Tomasi has crafted an intense story for Superman that builds on the aggression shown in the character’s other titles, revealing that despite Clark’s severely diminished powers, he hasn’t lost his will to fight for what he believes is right. Artist Doug Mahnke is one of DC’s top talents, and his work on this title is even sharper thanks to inkers Jaime Mendoza and Sean Parsons. Mahnke’s recent DC work has used a big team of inkers to capture all the detail in his pencils, but employing fewer inkers has brought more visual consistency to his work on Superman/Wonder Woman. Mahnke’s widescreen layouts bring an especially cinematic look to this preview of this week’s issue #20, which is accentuated by Wil Quintana’s atmospheric color palette, contrasting the brightly lit Oval Office scenes with the cool blue of the panels showing Clark’s imprisoned allies. This art team has given the book very rich visuals, and its work in this preview builds tension to set up the inevitable brawl between Superman and the people hurting his friends.